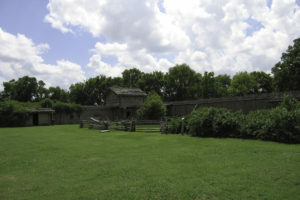 Interior of fort. The split rail fence currounded the garden. Cabin in left of frame, blockhouse in center. This entry was posted in Texas and tagged Comanche Indian raid May 1836, Comanche. great warrior chief, Cynthia Ann Parker, Limestone County Texas, Old Fort Parker, Quanah Parker, stockade fort. Bookmark the permalink.